Collecting genuine props and costumes is an expensive and time-consuming hobby. That’s why Ben Jarvis and Tim Crook of tabletop figures maker Megaton Games Ltd. came up with an affordable way to own authentic pieces of sci-fi memorabilia. They call their solution the Reliquary, a 7″x 2″x 1″ case made of two sheets of laser cut acrylic. Inside each case are five tiny pieces cut from actual props or costumes. This first edition, limited to 999 units, is called Sci-Fi Legends. It has a piece each of a Xenomorph costume from Aliens, an Ewok costume from Star Wars: Return of the Jedi, a computer screen from Star Trek: The Next Generation, Kaylee’s blouse from Serenity and Number 6’s red skirt from Battlestar Galactica. Each Reliquary will come with a certificate of authenticity. The certificates of authenticity for each of the props and costumes will also be posted on the Reliquary website for further proof. 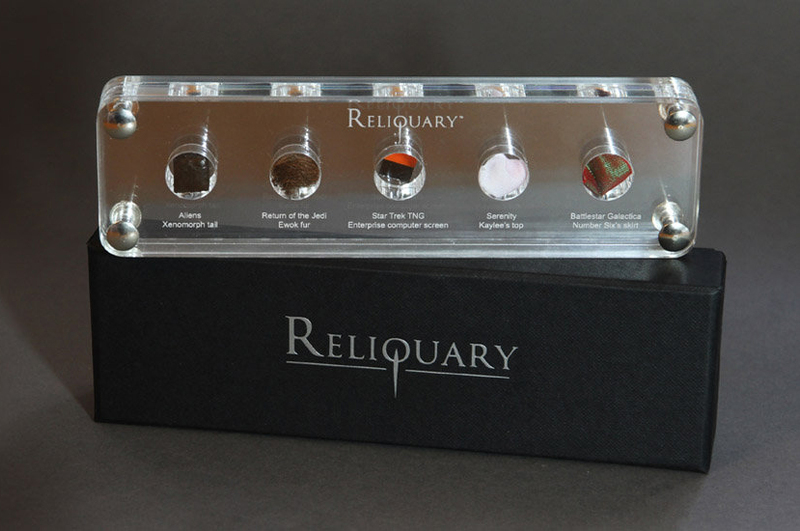 The miniature collection will be available only on Kickstarter, where a pledge of at least ~$90 (USD) nets you one Reliquary as a reward. This is an iffy use of the crowdfunding site in my opinion, but it is what it is.